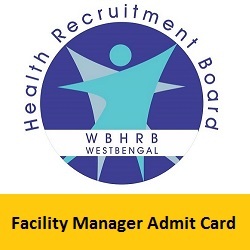 The higher authorities of the West Bengal Health Recruitment Board are planning to release the WBHRB Facility Manager Admit Card 2019. Candidates who have applied for the post of Facility Manager can wait until the officials disclose the WBHRB Facility Manager Hall Ticket 2019. There are totally 819 vacancies and the online assessment examination for the post will be conducted in the month of March 2019. Only the eligible candidates will get the admit cards. Also, You can download the admit card from the official website wbhrb.in. In the below sections of this page, you can find the selection process for the examination, mandatory documents, information available on the hall ticket and other details. The candidates who are not aware of downloading the wbhrb.in Hall Ticket 2019 can find the steps to download the hall ticket. We have also furnished you the redirecting links to download the hall ticket. We hope that the outline of the WBHRB Facility Manager Admit Card 2019 will give you the complete information and a glance idea about the job location, number of vacancies and other details. The selection process for the WBHRB Facility Manager Examination 2019 is simple. There will be a written test followed by an interview. The candidates who meet the eligibility criteria will get the admit card for the Written test. Candidates need to download the admit card before appearing for the exam. Without the admit card, aspirants are not allowed for the examination. The students who get more marks will be promoted to the next round. Candidates who do not meet the cutoff marks will be eliminated. Now, the shortlisted candidates should face the interview. Aspirants should carry the call letter along with them to attend the interview. The final selected candidates will be recruited for the post of Facility Manager. Before carrying the wbhrb.in Hall Ticket 2019 to the exam, aspirants should check the details present on the hall ticket. If there is an issue in the details, then report it immediately to the corresponding officials. The information present on the hall ticket will be as follows. There are some mandatory documents which are to be carried for the examination center. Therefore, candidates appearing for the examination should carry any of the documents compulsorily. To download the WBHRB Facility Manager Hall Ticket 2019, candidates should follow these steps. Initially, visit the official website of the West Bengal Health Recruitment Board – wbhrb.in. The home page of the website will be displayed on the screen. On the home page, you will find the modules such as recruitments, results, notice boards etc. Candidates need to search for the desired link from the modules on the home page. If the required link is found, then give a click on that link. You will get an application form. After filling the details in the form, click on the submit button. Download the admit card and also make sure that you take the hard copies of the admit card. Do not forget to carry the WBHRB Facility Manager Hall Ticket 2019 to the examination. We hope that the information given on this page is useful for your reference. For the latest updates, visit our website freshersnow.com. All the best for all the aspirants.